The church and Venezuelan authorities have long had a tense relationship, but the comments by Archbishop Diego Padron Sanchez, president of the bishops’ conference, refer to a process unilaterally initiated May 1 by Venezuelan President Nicolas Maduro to draft a new constitution for the country. To create that document, Venezuelans will elect hundreds of representatives to a constituent assembly July 30. 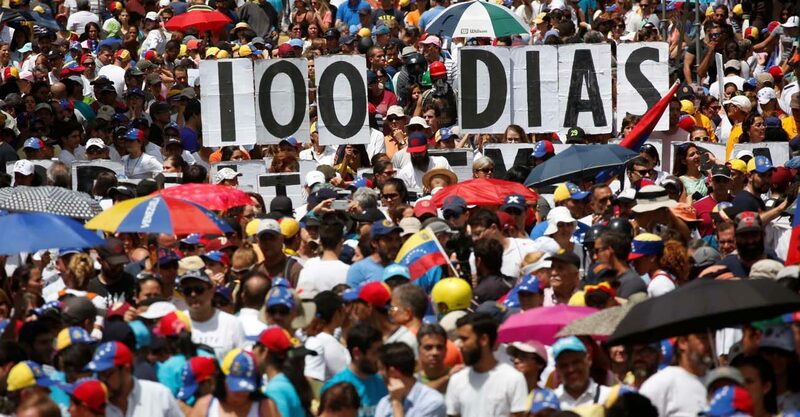 Maduro said the initiative aims to bring peace to the country, rocked by more than 100 days of anti-government protests in which over 80 have died. But the country’s political opposition and the bishops have denounced the plan as illegitimate and illegal. They believe the assembly’s structure would over-represent pro-government sectors, guaranteeing a body favorable to a government that polls show has the support of less than a quarter of the population. “A constituent assembly without consultation from the people first will bring negative consequences for the country because the government excludes many sectors to impose a constitutional communal state,” said Archbishop Padron. Offering a prepared statement at the end of the first day of the bishops’ plenary assembly July 7, Archbishop Padron also commented on a July 5 siege of the country’s opposition-controlled parliament which left five lawmakers with injuries. Dozens of pro-government activists stormed into the parliament building past complacent security officials. Fights ensued when the groups approached opposition lawmakers. Videos show the activists, some with ski masks, using poles and rocks to beat the lawmakers. “This was a criminal act, maddening, and a sign that the government doesn’t have the will to do away with violence and death and that it doesn’t value the parliament as a sovereign expression of the people,” Archbishop Padron said. Maduro condemned the violence and denied that it had been encouraged by top officials. While the ongoing protests were sparked April 1 after a Supreme Court decision to strip the opposition-controlled parliament of its powers, the anti-government sentiment also has been fueled by the country’s spiraling economic crisis. Venezuelans have endured three years of a deep economic recession that has brought with it shortages of basic food and medicine on store shelves. A recent study found that at least three-quarters of the population lost an average of 19 pounds last year. Caritas Venezuela has found that child malnutrition is approaching crisis levels in low-income areas. Archbishop Padron said Caritas Venezuela has initiated a humanitarian channel to address the shortages, but that it has encountered “obstacles at every corner” from government officials. “The people want freedom, bread, medicines, security and elections,” the archbishop said. At Mass July 9 at Caracas’ Basilica of St. Teresa, Father Jose Rosendo Diaz avoided directly addressing politics or the declarations from the bishops. Located only steps from government buildings, the church has become a focal point for conflicts between the government and church. Fistfights between opposition and pro-government sympathizers have previously erupted at the church after Masses. Authorities frequently accuse priests of including anti-government rhetoric in their sermons. “God is closer than ever, they just don’t have faith,” he said. Many parishioners, asked about the recent declarations by the bishops labeling the government as a dictatorship, called for peace and a de-escalation of the conflict. The moderated views of the faithful in downtown Caracas, a traditional government stronghold, could be worrying for the government. Officials will need these voters to attend the July 30 constituent assembly election to give the process legitimacy. The opposition has called for its supporters to boycott the election, and if voters like Rodriguez are more concerned about finding medicine than engaging in politics, they may stay home.